December | 2017 | Whose Education Is It Anyway? A thought provoking breakfast session at TeleTech consulting. Whilst I attended to think about my own brand and how I can support others with their own it was really an event that worked at multiple levels – individual, team, department, organisation, etc. nicely align to some of my recent work, including via the strengths based positive mentality. This brought my mind back to the Mercer/HBR paper I picked up at the Leadership Symposium on “Bottom-Up Leadership” and their own Venn diagram showing the need to combine personal strengths, personal interest and business needs. I was particularly interested in attending after a recent event where I saw some old colleagues for the first time in c.5 years. Those interactions highlighted the long term perceptions people hold and the TeleTech event described this as the weighting of perception on one trait rather than taking a balanced view. The personal brand was described as the “story people tell about you behind your back” so I guess we all need to get back to basics and reflect on our expertise. I also thought this paralleled with the idea of the weight we give to first impressions. The sweet spot, the trait to focus on, being the middle point of these three. The challenge here was to “go big” on the sweet spot, this posing a test for me as I would like to be seen as being good at a number of areas of L&D competency. However, when I was looking for work a couple of years ago, I suspect I was not “selling” myself well enough due to too broad an interest? I also thought there were challenges around what I could do and what I have actively done a lot of – the two do not automatically line up but that is not necessarily a bad thing if it can be justified in the middle ground of the 3 brand items. A couple of really good sessions* at this Kineo client day. In the same week as the UKeIG event this looked at the digital transformation of L&D and, therefore, the future of workplace learning. The event took place alongside the availability of Kineo’s “Time to Transform” guide. The guide is a nice summary of the state of the ‘learning landscape’ and, I would presume, the kind of developments most L&D teams are working on. That said some of the points, such as “look ahead and promote the resource-based approach”, are not very ‘transformative’ (although I appreciate my background means I don’t have the ‘course first’ mind-set that still plagues the industry IMHO). Time to Transform states “arguably at the heart of all digital transformation of L&D will be the role of data” and the session on xAPI was great. I made a rather rambling point/question at the end of this, what I was basically saying was xAPI is always talked about in the same way as SCORM – i.e. to track things. What this session actually pointed out, to me, was that xAPI is instead a standard to help aggregate data. Using it in this way stops the risk of L&D, or at least an LRS, being a silo and thus largely pointless – indeed the red herring I warned about. However, this was one of those sessions where I thought, “this is great BUT only really if you happen to be doing it first in your organisation”. Where organisations are already data warehousing, managing metrics, etc. the Tin Can approach would seem to not add as much value. “Meeting MABLE from Mitchells & Butlers”, this session felt similar to the xAPI one in that your learning platform can be a fantastic, a ‘go to’ place, but it really only works when you aggregate on it and drive traffic – i.e. you do not have other silos, Intranets, etc. stealing time and attention from your colleagues. M&B’s presentation showed how their advertising and culture is clearly fantastic and the value in L&D tram’s bringing in external advertising and branding support. The take-up of the platform and clever creation of a persona for the platform (including use of Facebook) – always referred to as “she” not “it” – is clever and in line with some of the cleverer characterisation of other services (such as museum communications via Walrus and library management via ‘cuddly’ penguin). I also liked M&B’s #learninghero campaign through Totara Social to recognise who had helped colleagues to develop and grow. This is part of an impressive digitisation, including the carving up of numerous training days into 1-hour Adobe Connect sessions. The other sessions I attended initial results from LMS platform research – presentation here, nothing really surprising and a session on credentials which will be familiar to users of open badges and related approaches. This day workshop really ended up getting me thinking and my thoughts (as articulated below) are probably still not very tidy. What does being ‘digitally literate’ even mean? What does digital literacy look like? What does it mean to different industries/sectors? How does it compare to Information Literacy? Perhaps predictably for a CILIP group event the first couple of presentations were quite focused on Information Literacy [in the SCONUL kind of sense] and the day did continue to think a lot about electronic resources and e-information. This said, it did highlight how different people have different views on DL, for example mine would be more in line with the Belshaw model than how information professionals might consider the topic [note I tend not to call myself an info pro anymore!]. 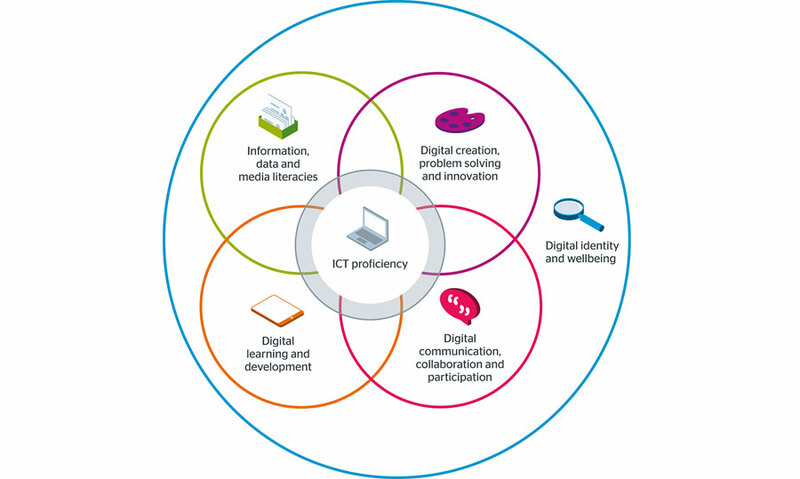 Personally, when I think about digital literacy, I’m thinking digital competency and capability. This includes how people can be encouraged to be open to technological change, continue to develop their knowledge and skills within the requirements of their role and for possible future needs. Indeed in the initial brainstorm of what it meant for us, I made the point of saying that it really can mean anything and everything. I continued by arguing a need to “get on with it”, more than worrying about definitions, in a similar way to how L&D faffed about with what “coaching” meant only for people to go ahead and crack on with it (in various guises). I'm always torn on people struggling because 'it doesn't look like Google' #ukeigdigwk – part UI failure, part user impatience, part lack of knowledge and skill in digital tool(s), etc. No easy answer to fix? A couple of sessions referenced Information Literacy in the Workplace by Marc Forster. I don’t think I’ve ever looked at this [at c.£50 (it’s a Facet book after all) I’m unlikely to] nor the also referenced Information Literacy Landscapes by Lloyd. Overall there remained a feeling that we were talking about a narrow subset of the digital skills I would consider people need. I quite liked this model when reflecting on the day and Googling alternatives and, for workplace’s aligning to the apprenticeship standards, perhaps functional skills frameworks are the standard to be applied. The JISC session nicely considered the wider issues (Flexing our digital muscle: beyond information literacy) but, unsurprisingly again, was very HE orientated – their model of “digital capability” however could be flexed for other environments. Is the model of creation, problem-solving and innovation (in addition to an information focus) the way to go when thinking about digital skills – i.e. should they just be embedded at appropriate (Blooms taxonomy?) levels of technical capability? Overall, there is a huge impact on productivity from information overload, a lack of digital skills and related issues. If we (as in our organisations and the UK overall) are to improve perhaps we need to recognise this and invest in people for longer term impact and improvement. Whilst one session, correctly, pointed out that work is about “KPIs not coursework” it is also an oversimplification. As required skills are changed by technology the knowledge, skills and behaviours will change and be reinforced. In terms of quick wins, the start point may well be developing some shared vocabulary within your own organisation to then support people with.